The much debated ban on “anchoring” during the putting stroke is one of the hottest topics in golf today. But it’s somewhat misunderstood. I hear various stances on the topic and an array of interpretations. I do come across some excellent takes on the issue, but there are plenty of misinformed statements. Here are the bare bones you need to know. The proposed change is to rule 14 of the universally accepted laws of golf endorsed by both the R&A and the USGA. The 90-day consultation period announced is set to close at the end of February and, if the governing bodies have their way, the ban will come into play on the first day of 2016. That’s in line with their four-year cycle of maintaining the rules. The legislation may sound complex, but there is a simple principle that guides the entire change: there should be no anchoring of the Putter or arms to the body at any stage of the putting stroke. That leaves plenty of unconventional strokes outside the scope of the proposed change. All of the following would be unaffected and remain legal: the claw grip, broom handle Putter, holding the elbows against the body, grip resting against the forearm. Any form of anchoring of the grip to the body is very much a part of the proposed ban, as is forming an anchor point between the forearm and the body. Manufacturers are also likely to enter the battle. They will argue that anchoring is one option to help Amateur and Professional players alike. And that makes it a good thing for golf – more fun, more players, more business. You’ve reached a point where your technique is sound and you’re getting good distance through a flexible wind-up on your backswing. But you’re now looking for ways to gain yards through a more powerful swing. Or maybe you aren’t able to achieve a very flexible backswing due to structural limitations in your shoulders or spine. Either way, if you want to hit booming drives and get sensational recovery from the rough, you should perform exercises to strengthen the muscles that are specific to the golf swing. I’ve selected the best three for you to try at a gym. Add power to your swing and improve your distance through a few simple exercises. Complete the full routine below to power up your game or focus specifically on Flexibility, Power or Core Stability exercises. 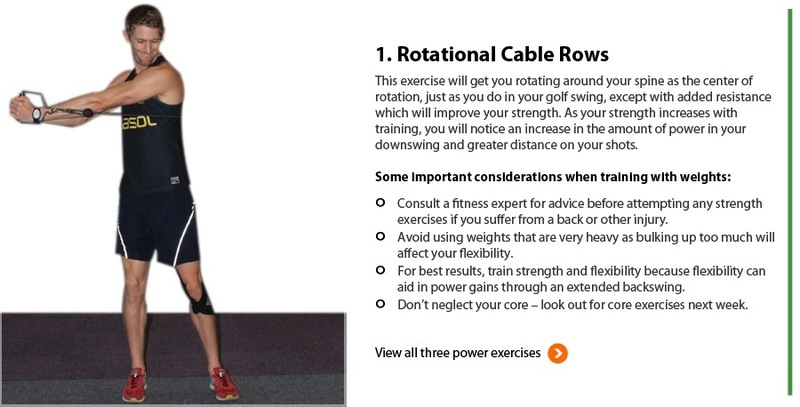 It is advised that you perform these exercises with an exercise professional. This entry was posted in fitness, golf, golf instruction, golf tips, sports and tagged coaching, draw, fitness, golf, golf tips, slice, sports injury, TPI. Bookmark the permalink.